New viruses are being made and released onto the Internet all the time and it’s possible for antivirus software to only start detecting it after a few days. In the duration of staying undetected, the virus could have infected a lot of computers. Some viruses are invisible which can only be detected by using special tools and undetected so that the computer can stay infected as long as possible. There are some viruses that will go to the extent of disabling tools such as the Windows Task Manager, Registry Editor, Folder Options, Command Prompt and other functions built into Windows to prevent users from checking and fixing the problems. One such virus that can cause the above mentioned problems is the Brontok virus, which will make some changes to the system restrictions in order to hide itself from easy detection and also from easy cleaning. The Windows Task Manager is one of the most useful tools to check for any unknown running process. You can either access it by pressing Ctrl+Shift+Esc, right click on the Task bar and select Start Task Manager, or type taskmgr in the run box or search programs and files bar. If the Task Manager is disabled, you will see an error popup that says “Task Manager has been disabled by your administrator”. 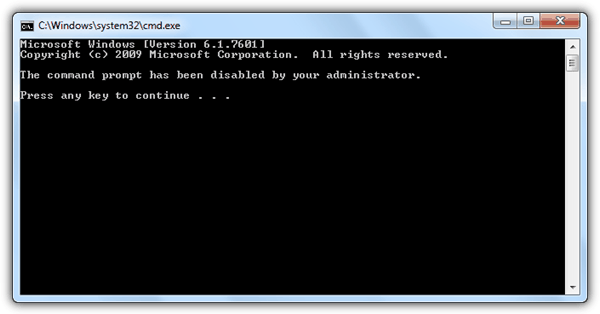 In the case of a disabled command prompt (cmd.exe), it will still run but will show a message “The command prompt has been disabled by your administrator. Press any key to continue” in the window. For the Folder Options being disabled to prevent Windows from showing hidden files, the menu will be removed from the Tools menu bar, grayed out in the Organize menu and you won’t find the shortcut icon in Control Panel. All these restrictions can be easily lifted by making some changes on the registry using the Registry Editor (regedit) but unfortunately it can also be disabled and you will see the error “Registry editing has been disabled by your administrator”. Besides restrictions, there are many other features that can be affected in Windows by a virus. Another common problem is the virus breaking the .exe file association so you can’t run any programs to fix any problems. Here’s a selection of tools to help restore Task Manager, Regedit, CMD and Folder Options after being disabled by a virus. Do note that the infections need to have been removed before running one of these tools, otherwise the virus will simply disable the setting again. For nasty infections you may have to download and run an antivirus boot CD. Make sure to right click and “Run as Administrator” for these tools or the fixes won’t apply themselves properly. The Re-Enable tool came about after one of our forum members tangomouse helped another forum member with a problem, and decided to create a tool to make things easier in future. It’s now a popular tool on the internet and can re-enable a disabled Task Manager, Registry Editor, Command Prompt, Folder Options, even System Restore and a few other system functions that are sometimes disabled by virus infections. By default, all options are enabled and you can simply press Re-Enable to reset everything, or click the button to Uncheck All and tick only what you want. The disable feature will be instantly enabled or if not, a reboot would do the trick. The Tools menu has some other very useful options like unhide hidden drives, repair Explorer.exe startup issues and reset file and folder attributes etc. If you have any bugs or suggestions, they can be left in the raymond.cc Re-enable forum thread. 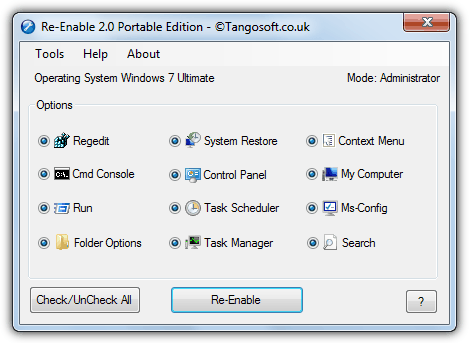 Tangosoft no longer supports a portable version, but it can still be downloaded from Softpedia. Requires .NET Framework 3.5 to run (portable includes the .NET files). Although it’s stuffed full of advanced options and functions to help with removing the after effects of virus infections and also helping to prevent them in future, Virus Effect Remover can be used to easily reset the common items disabled during an infection like Task Manager, Command Prompt, and the Registry Editor. Some other more advanced features include autorun control, file unlocking, file and folder security permissions, services control and startup items control. Virus Effect Remover comes as either setup installer or portable versions and to see what has been detected as changed or disabled, look in the information box. The One Click Registry Heal button does what it says and resets everything shown in the information box. The Windows Tools section will first make sure Task Manager, Regedit or MSConfig are enabled, and then launch the respective tool. This is a useful tool to have around because of the wealth of after virus recovery tasks that can be performed from the one program. 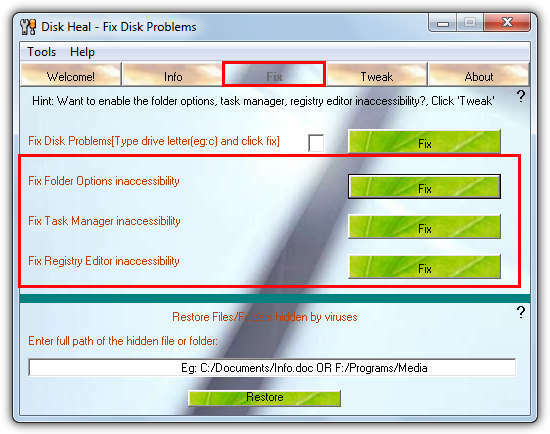 If you can get past the Disk Heal GUI which makes things difficult to read in places because of the background, you’ll find it has some useful options for fixing the missing folder options, and re-enabling the Task Manager and Registry Editor. It also has a fix option for when your C drive won’t open in My Computer, and can also restore files and folders that have been intentionally been hidden by a virus. The program has to be installed but it’s a small price to pay if you need the options, there is no adware or junk offered during install. Launch Disk Heal and go to the Fix tab, then just click the fix button for whichever option you need. If there’s nothing wrong with the default setting you’re trying to fix, the program will tell you and not do anything, or there will be a success popup message if it needed fixing. The Tweak tab has several security, appearance, Internet Explorer and Control Panel tweaking options. FixUp Restrictions doesn’t just include the ability to enable a few options like Task Manager or Regedit, but has a total of 42 check boxes available to enable, repair or reset an number of different system settings which can be affected by malicious software. Other repair check boxes include desktop icons, hidden/restricted drives, system and Internet Explorer menus, shutdown button and Add/Remove programs. Like Disk Heal, FixUp Restrictions needs installing but it’s clean and offers nothing during setup. On launching the program it runs an instant scan to see which of its supported options are not their default setting, and only gives you the ability to change those that can be reset. This is useful so you don’t try and change something which doesn’t need it and could end up causing other potential problems. Click Check All to reset everything that needs resetting and then Remove. There is also a basic startup programs manager to add, edit or delete startup items. The Regain Power tool is quite useful because although there aren’t loads of options, the essentials are there to enable several system components after infection, and you can do it from a reasonable size (~3MB) self contained portable executable. 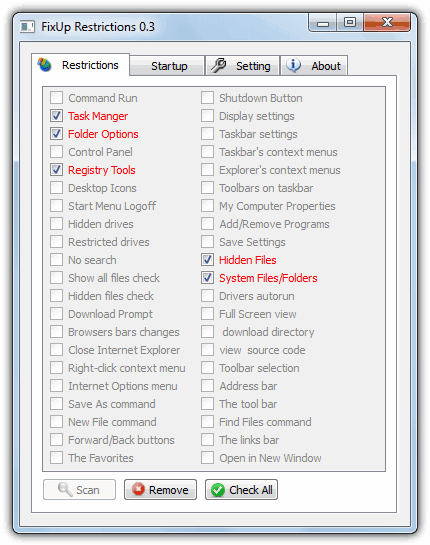 A total of 9 options are available including Show folder options and enabling Task Manager, Registry editor, search and the Run dialog. When you run the tool it should show in the window if any of the options are not at their default settings. Just select what you want to enable or show and click OK, there is not confirmation or reboot prompt for any selected check boxes with an asterisk. 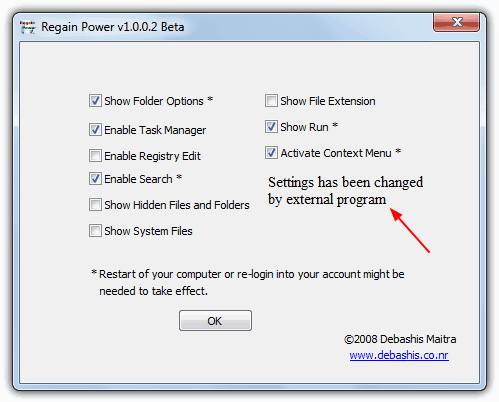 Simply reboot if the option still doesn’t work, the options such as enable Regedit should work straight away. Quick Fix has separate programs for XP and Windows Vista/7 which look a little different but work in the same way. This is more of a general tool and has over 100 fixes, tweaks and repairs for just about every situation, and also has a number of options to re-enable Task Manager, Command Prompt, folder options, Registry Editor, Control Panel etc. Weirdly, Quick Fix is a standalone portable application but you have to install it and make sure to opt out of the adware, then copy the executable from Program Files to your folder of choice. 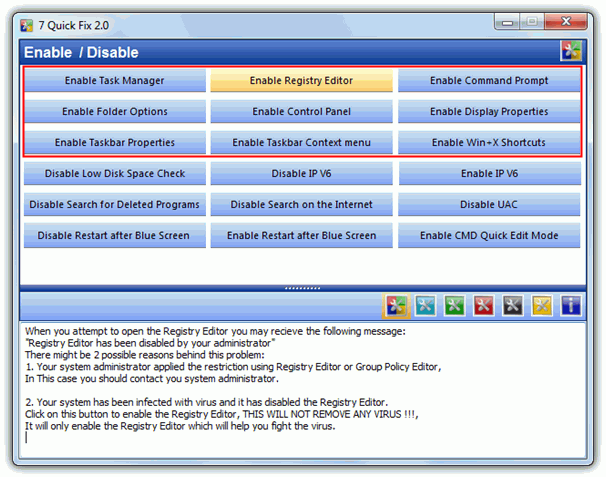 The enable / disable tab is selected by default and has the options to enable the necessary options disabled by a virus. There is plenty of useful information in the lower window when you hover over a button including whether you need to reboot to apply the change. Just click the selected fix button to reset the function. The icons in the middle of the window let you access the other fixes and tweaks the program has to offer. Most users who are security conscious or have had to remove malware before will know of Malwarebytes Anti-Malware and how effective it can be against many types of infections and spyware. Something else it does during a scan is to check several system areas which are often compromised by malicious software, and if they have been changed, reset them back to the defaults. This also includes when components such as Task Manager, Command Prompt, Regedit and folder options have been disabled during a virus attack. Simply download and install MBAM, then run it and press the Scan button to perform a quick scan from the Scanner tab. The good thing about using Malwarebytes is it will also pick up other infection issues that antivirus scans may have left behind, and will also fix many other problems that may still be present, not just Regedit or Task Manager being disabled etc. If the scan picks up your disabled programs, just make sure they’re ticked and click Remove to reset to default. A reboot may be required depending on what else is found and removed. Malwarebytes Anti-Malware is a highly valuable tool to have installed anyway, even if you don’t use it for this task. Although the tools above will do what you want and re-enable the functions that the virus disabled, if you don’t fancy downloading or installing software just to alter what is essentially a few registry settings, you could simply use a small file of a few bytes to fix each individual issue. Re-enable Regedit – This is a small .inf file from Symantec that was made to enable the Registry Editor and reset the associations of executable file types. Right click and “Save as” to download it, then right click on the file and there should be an option to Install on the context menu. After running this you will be able to run Regedit or execute and import .reg files. 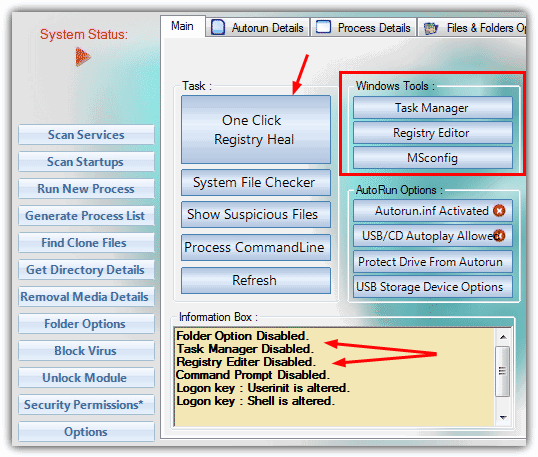 Re-enable Task Manager – Download the .reg file and double click to import into the registry. If Regedit isn’t accessible, use one of the tools above first. Re-enable Command Prompt – Download the .reg file and import it into your registry. Re-enable Folder Options – Like the above 2 .reg files, download and import into the registry. Reboot or logoff for this change to take effect. omg i have been problematic for years but not anymore. thank you so much genius! the virus effect remover worked for me. i tried the re-enable 2 but nothing happened when i run the installer. Thank you so much. Malware Bytes worked its magic. This is amazing and genius work. Thank you very much, it helped me a lot. Damn.., there is no use of fighting this my damn Virus. =( I cant install anything either. I cant open antiviruses. Plus non of my admin rights work. If I clik try to execute a file with the admin rights it would say it did not find the correct path. Plus when i have diagnose put on. It will say ” a problem is preventing the troubleshooter from starting”. Its NO USE!!!!!!!!!!!!!!!!!!!!!!!!!!!!! Im so mad. Ill have to reset the whole damn PC. Thank you so much!!! Love you so much!!! Thanks so much RAYMOND, that software work to my PC. :) . the problem just fixed… me search for my problem 4 hour to found out my problem but me found in here all Thanks too RAYMOND FOR HELP!!!! thanks a lot it worked…. I know MANY people have already said this….. but THANK YOU SO MUCH! Why can’t all software geniuses put their talent to constructive and beneficial purposes??? Many many many many thanks! Omg thank you so much this file worked! This is better than other Remove Restrictions..
thank you! for this valuable and meaningful article!! hey raymond, thanks a lot. that software work to my PC. :) . the problem just fixed less than 1 minute. thank ray, finally i found this tool. i `D LIKE THIS SOFT WARE AND THIS WEBSITE SO MUCH! this software is amazing. Thanks raymond. That was a savior in a jiffy. Thanks. thank u very much I was thinking of formatting … its rocking ..
hope to get such good software in the future…. I didnt know about this tool. So I had to format the C drive and reinstall windows everytime to get rid of this problem. Now I get a very simple tool. Thank you very much for your easy way……. Thanks a lot, it did help me mate. hope it will be useful to others as well. 5 stars to your program, I guess I will try it the program tomorrow on my friend laptop (after it was cleaned from brontok using kaspersky and scan spyware, regedit and the folder options remained corrupted). I hope things will go smoothly. Thank you for your solution, I am finding it quite long. thanks buddy….u saved my system frm a format..!! cool dear. thanks for help. Thanks alot, the (RRT) tool was great and it recovered my folder option, regedit and task manager. Thanks for RRT. It’s a great tool not only for me, but also for other folks who have problems. Thanks for this tool. It is really useful. I have nothing to say.. they have said everything…. keep on helping people like us… GIFTED BOY!!! Thanks Raymond my problem got solved of folder option disabled with ur solution…..
dude. You are such a great help. Thanks. Nice Blog, Keep it Up..!! wow.. cool dude.. thanks for this.. i need to format all over again because of this virus but thank you so much for this small but useful software.. Thank God! and thank you for your RRT. i was having trouble with the hidden file folder option. with your tool i could remove the restriction. thanks a million for you help. THANK YOU RAYMOND!!! my folder options is back again….. Thanks that’s a very useful tool. I’ll use it next time I encounter this problem. thank u very much for providing this tool, well done. You are the best man!!!!! !more power and may the “Unknown Creator” gives you a long lasting life here on earth…. thank you very much I was thinking of formatting … its rocking .. I don’t know who you are (I found your site through Google) but you are a lifesaver!!! I had the Brontok virus, and I couldn’t access my files because it was hidden! Thanks a bunch! Thanks Raymond!!!! You are the Best!!!!!! I almost format my hard disk and is suggested by my IT and Most Expert! The Entire Company got this virus by just a pen drive! The file name is “Im-worm.Win32.sohanad.t and SSVICHOISST.exe! Terrible virus that goes to all your different directory and kills your task manager! Just won’t operate anymore! And is without your knowing and authorities, not detected by most Anti-virus software! Thanks once again for restoring my task manager with your software! This is a very amazing and cool tool for everyone. It is not how easy to make a tool or how easy it is to use, it is the UTILITY that it brings along with it and i think it is great. thank you so much.. well done!